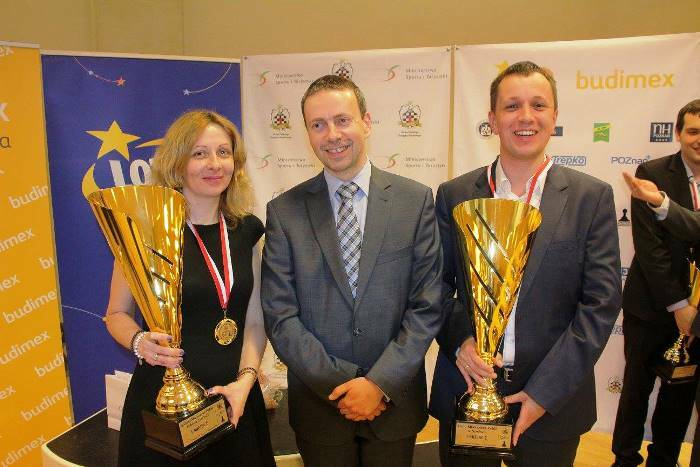 Radoslaw Wojtaszek and Monika Socko both earned 20,000 PLN (4,600 EUR) after taking clear first in the 2016 Polish Open and Women’s Championships in Poznan. That was Radek’s 3rd title and Monika’s 7th, though the Polish no. 1 called the new policy of equal prize money for the two events "unfair to men". 2015 Champion Grzegorz Gajewski couldn’t recover in time from his month helping Vishy Anand in Moscow, finishing rock bottom with four losses and no wins. 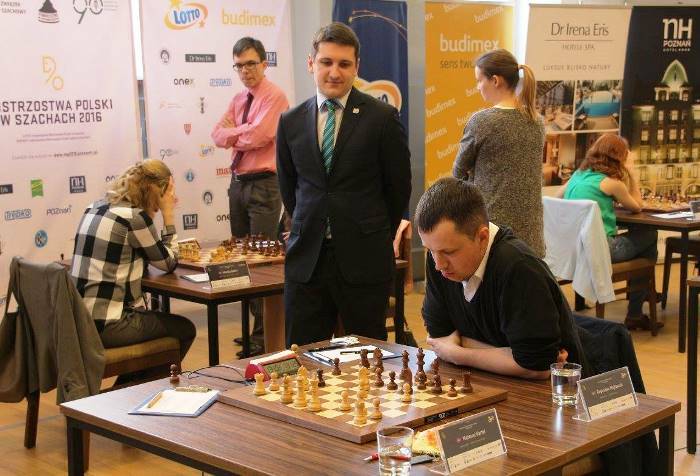 The 2016 Polish Championships succeeded in attracting almost all the best players in the country to play in 10-player round-robins, with the men’s event managing an impressive Elo average of 2610, while the women hit 2349. Alas, here Maciej didn’t play 37.Qd5! (or 37.Qe5) when all three results are still possible, but 37.Qg6?, when after 37…Qb5+! the c-pawn was dropping and the outcome of the game was clear the moment Wojtaszek made it to move 40. As it turns out, the idea of 6.Nb3 in the Najdorf is far from as stupid as it looks! After getting good (great) positions in Moscow against Artemiev and Gelfand, today I got a big advantage against Radek Wojtaszek – and it’s hard to find a better specialist on the opening. Wojtaszek had of course prepared a deviation, but he still got hit by a monster shot, 10.Nd5! Bartel revealed afterwards that although the computer likes 10…exd5 11.gxf6 dxe4 for Black, his plan was a move the computer doesn’t show immediately – 12.Rg1!, when the natural 12…Qxf6 runs into 13.Na5! Wojtaszek instead went for 10…Nxd5 after a 47-minute think, but he later miscalculated in a tricky position and was soundly beaten. Surprisingly, although Bartel finished as the tournament’s one unbeaten player he only won one more game and had to content himself with a bronze medal – just as he did at the 2016 Aeroflot Open and the 2015 European Championship. Chwila przerwy w przygotowaniach do Lotto Mistrzostw Polski.Kibicujemy z Aliną rodzinie Bartlów w Warszawskiej Lidze Koszykówki. The shock result was 2015 Polish Champion Grzegorz Gajewski finishing in clear last place - a mirror image of his result a year ago, when he’d scored four wins and no losses. Now it was four losses and no wins! There was an explanation, though – Gajewski had come straight back from seconding Vishy Anand in the Candidates Tournament. I didn’t have any great hopes after a one-month stay in Moscow… Maybe if the goal had been achieved and Vishy had qualified I’d have arrived happy, but as it was I just arrived tired. Maybe you couldn’t see that at the start because I didn’t lose, but in the first round I was already lost and in the second I was worse - I made some sort of crude oversight in every game. Generally you go to sleep at 2, 3 or 4 am, you get up in the morning and then until the game you prepare. Then during the game itself you can’t rest too much either due to the emotions and wanting to see if what was meant to happen happens – and if it doesn’t then you look at who went wrong, and who’ll win. It’s like that for 3-4 hours, and then after the game there's dinner and a conversation and then the same again. The rest days are actually worse than the non-rest days! It’s a great thing and very useful for me, but I think you need some kind of week-long break to recover. First, he has the typical sporting anger that the best all have, but second he has the purest form of love for chess, in the sense that after every defeat he’ll sit down for two hours on the same day and analyse and try to understand why he made a mistake. What impressed me most was his urge to draw conclusions from those defeats and not forget about the games. After a loss some other players don’t want to look at chess again that day. They have dinner, go to the sauna, play football – anything, just not to think about chess. At least Grzegorz has someone to console him for the result in Poznan. 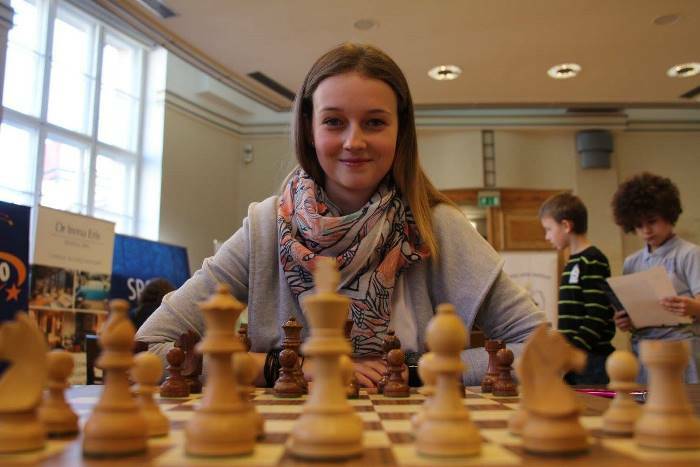 His wife Joanna Majdan-Gajewska went on a run of six losses in a row to also finish bottom, dropping 48 rating points despite a good finish. Radek Wojtaszek was also at the centre of controversy during the tournament, though it wasn’t for this! 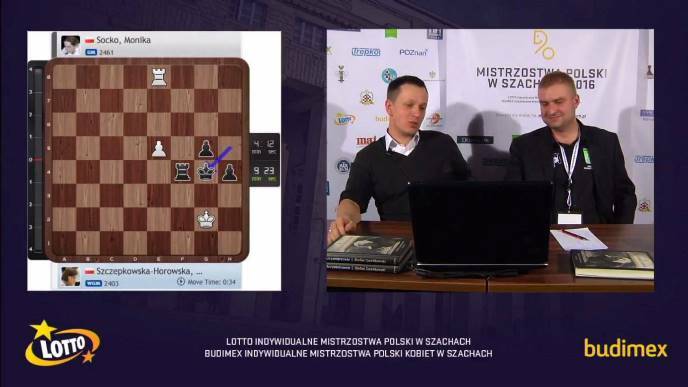 As commentator Marcin Tazbir admitted, this was one of two April Fool’s jokes sprung during the live commentary (the other caught more people out, with the microphone accidentally left on as Duda’s coach Kamil Miton gossiped about his player and those around him). There’s an argument that women's games are cooler, because more happens, but more happens just because the level is lower. He pointed out that the Women’s World Championship is unlikely to be played for the same amount of money as Carlsen-Karjakin. The interview was memorable for taking place against the backdrop of a game between Karina Szczepkowska-Horowska and Monika Socko, which Radek noted showed, “what the fight for gold looks like among the women”. Today I won so I can come and answer that question, because I really didn’t like what Radek Wojtaszek said during my game against Monika, claiming that the level of our game proved that the prizes shouldn’t be equal. As Monika said, Radek isn’t a sponsor of our prizes and it strikes me that he spoke incorrectly and out-of-place. In my view, if this is a Polish Championship then why should we have lower prizes. It’s the same status of event and the fact that blunders occur in our games – well, look at the games by the men, like Radek in the first round, or Radek against Darek (Swiercz). He can criticise, but let him take a look at himself. Wojtaszek: How do you rate your success? Socko: Well, it’s undoubtedly a success for me, but unfortunately I can’t be happy with the way my play went. 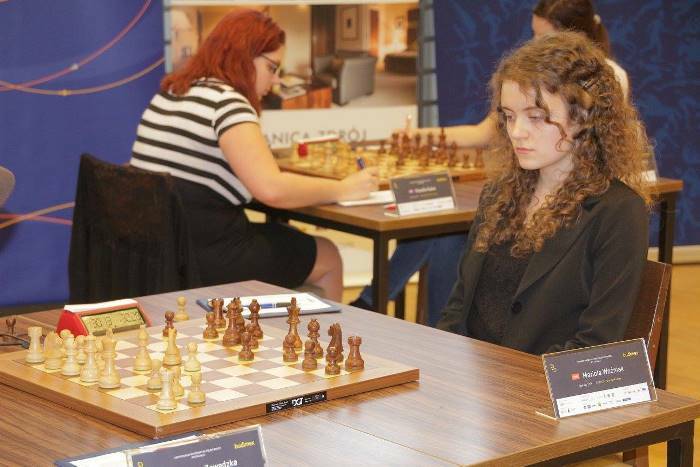 7 points from 9 games is of course a great result, and was enough to win the title of Polish Women’s Champion, but I’m a little unsatisfied when it comes to preparation and the way my games actually went. Those games should, after all, have been at a slightly better level. Wojtaszek: So modest! It strikes me that everyone will forget about form, but I wanted to ask which gold that is for you and how many more you’re planning. Socko: That’s my seventh title as Polish Women’s Champion. 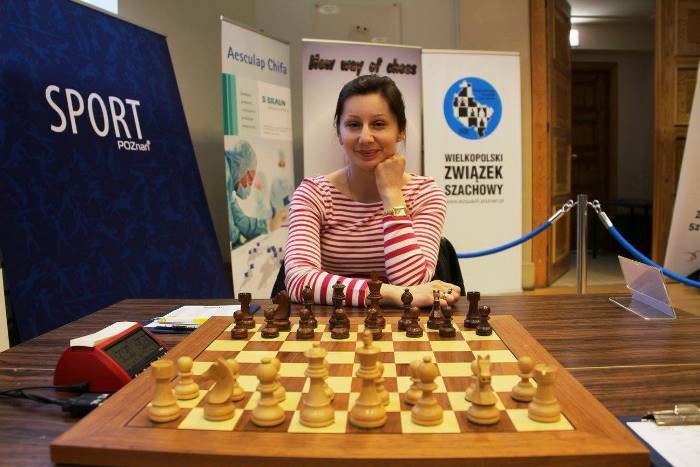 I just learned that until now only Iweta Rajlich had seven titles, because Hanna Erenska had 5 titles and therefore at the moment Iweta and I are record holders (although Krystyna Holuj seems to have won the event 9 times). I’m happy with that. Now, Radek, maybe you can tell me which title that is for you and how the tournament went for you? Wojtaszek: That’s my third gold, and in fact I got my first gold in Poznan as well, at my first attempt, so it brings back memories – again Poznan, again gold! I would say, in turn, that my form was ok here. One loss, but that didn’t really knock me off balance because my opponent, Mateusz, played great. I’m glad that despite us being in the same situation – the young are putting us under pressure – we’re still holding on. Socko: The young, and also being favourites – as we know, it’s not easy to play as a favourite. I don’t know about you, but for me, that doesn’t go so well. Wojtasek: But we always handle it! Socko: Yes, somehow we managed! So I congratulate you again! Wojtaszek: The same to you.